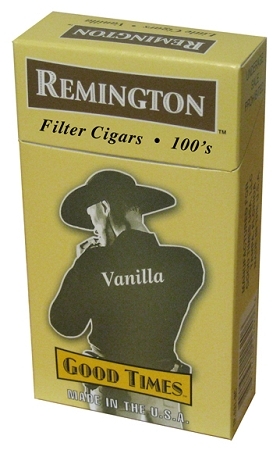 One Carton Remington Filtered Cigars Vanilla 100 Box. 200 filtered cigars packed 20 Cigars to a Box-Pack, that adds to your enjoyable smoking experience. I have been smoking the vanilla for quite awhile I like the vanilla better then the rest of the flavored cigars. The Vanilla Remington's Are smooth tasting They have a great taste and very enjoyable!! Great purchase, timely delivery. Been smoking these for 5 yrs now. So happy i found these as opposed to cigarettes!